Uncategorized | Welcome to my blog! 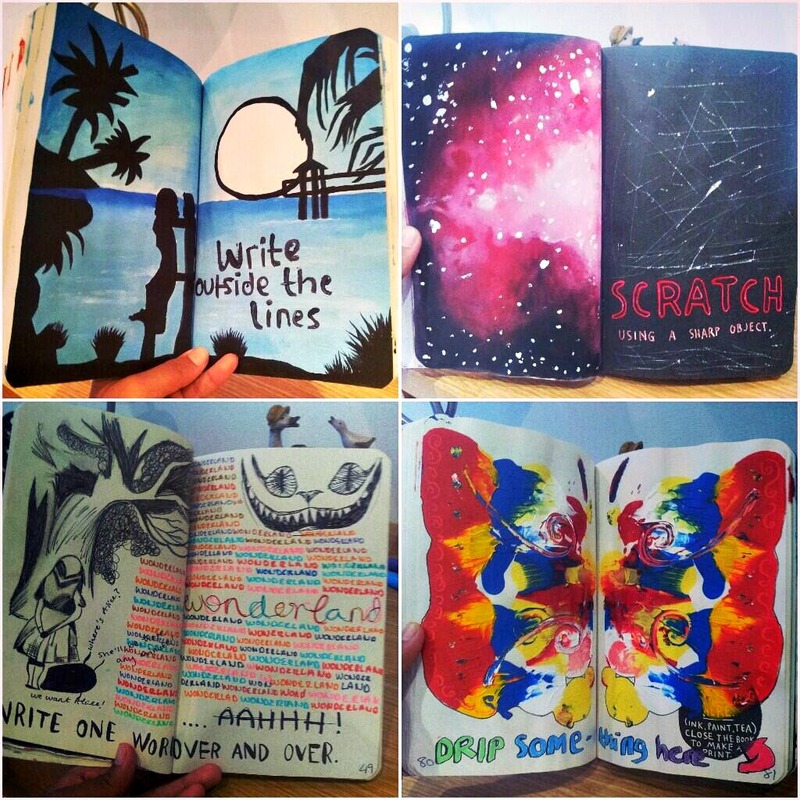 Since someone showed me their own book of creativity, I have been desperate to own my own. the Wreck This Journal by Keri Smith is a fantastic book that has over 100 pages for you to let your imagination run wild. Each page is empty, except it has an instruction of what you should do it. For example: “Infuse this page with colours” “Collect your stamps here” etc etc. Once I got stuck into it, I loved it! It was extremely fun to do whatever I liked in it. It was just like a GCSE art book, only, I didn’t have to worry about what anyone else thought. On the top left page, the instruction was “write outside the lines”. The only other thing on the page was a big circle. As soon as I saw it it reminded me of a sun/moon. Immediately I thought “Im going to do a silhouette!” And here I am now, with a painting of a romantic couple by the sea on a hot day. The painting was just a bit of fun, it didn’t matter what I did with the different shades of blue. On the bottom left pages, the instruction was “Write one word over and over” I evidently chose “Wonderland”. Simply because, it is a beautiful place which is one a kind, special and unique in it’s own way. The bottom right was a messy idea! “Drip something here, tea, coffee, paint. Close the book and make a print” I let my inner child in me go crazy here. I poured a load of random paint on one side of the double page, closed the book and voila! A strange looking butterfly! The beauty is that it doesn’t even have to be anything, you just need to have fun doing it. I recommend The Wreck This Journal 100%. It is a bit of fun! Acrylic paints, Oil pastel and felt tips used. She was the most beautiful woman that ever lived.